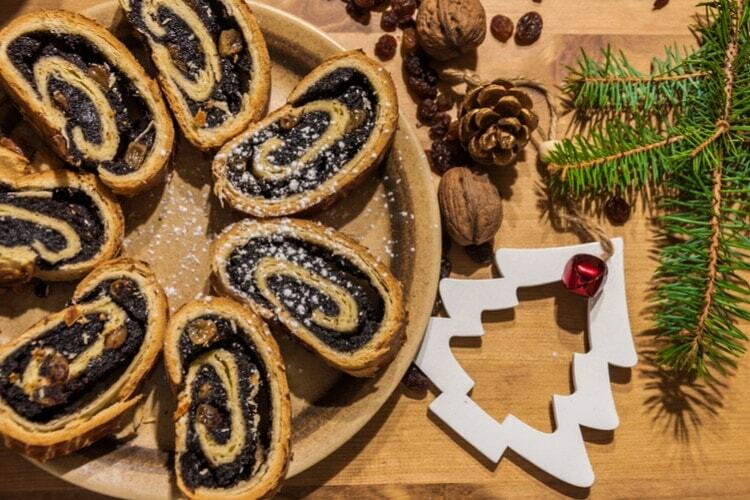 Want to know more about Hungarian Food and Cuisine? 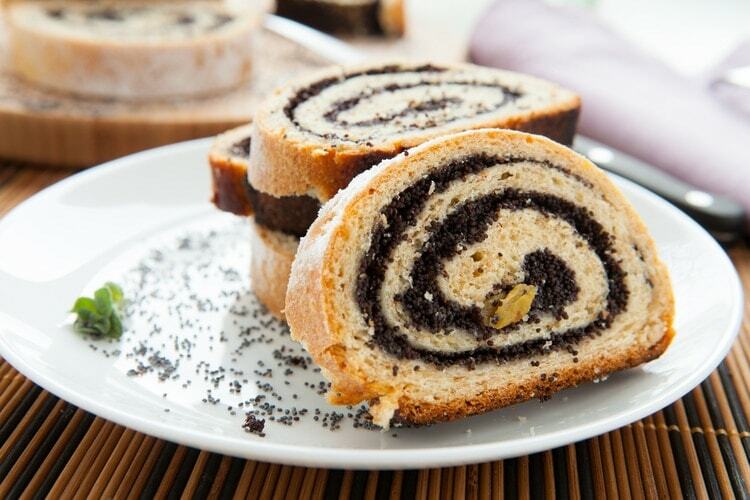 Here are 21 Traditional dishes from Hungary that you should try while visiting! 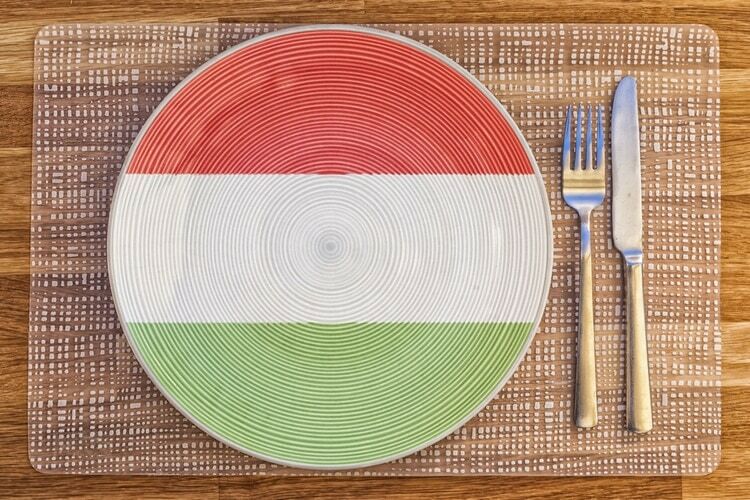 I have always had a love for Hungary due to my Hungarian heritage, so I’m a bit biased of course, but I really do love Hungarian food, and I’m very excited to share these 21 traditional dishes that I think that everyone should taste! 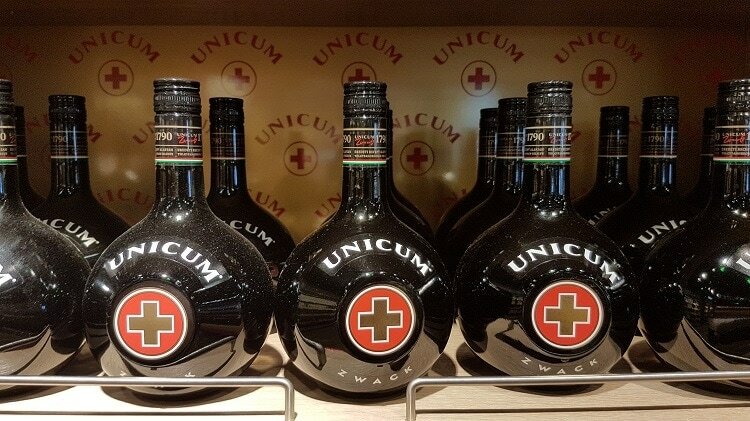 I also share some Hungarian desserts and beverages as well as what Hungarians eat for Breakfast, Christmas and Easter. 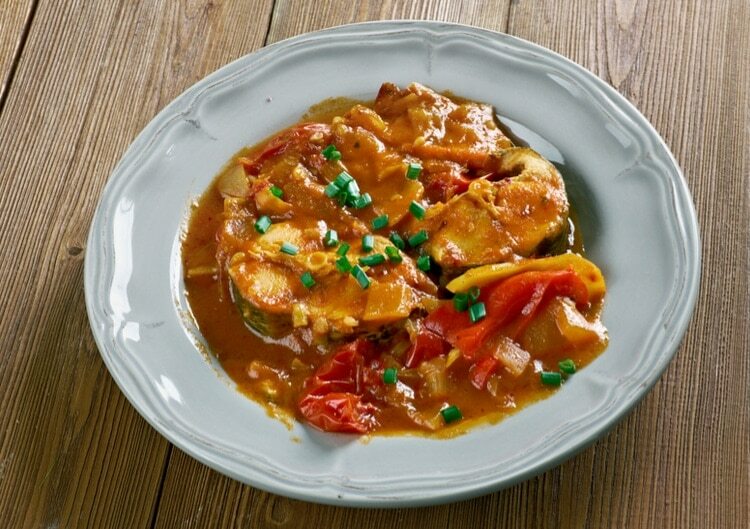 Let’s start with a real classic, chicken in a creamy paprika sauce. It’s often served with sour cream, and you can find this dish in most restaurants around the country. Stuffed peppers is another favorite of mine and a classic Hungarian dish. The peppers can be filled with meat, rice, and vegetables cooked in a sauce. There are vegetarian versions as well without meat. I could eat langos every day for the rest of my life. It’s so delicious, cheap and easily available in Hungary. 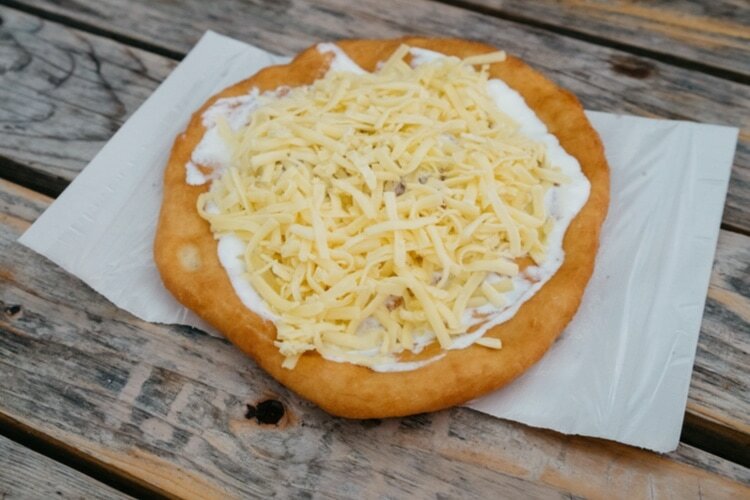 Langos is basically deep-fried bread served with various toppings. Sour cream and cheese are popular choices for topping. 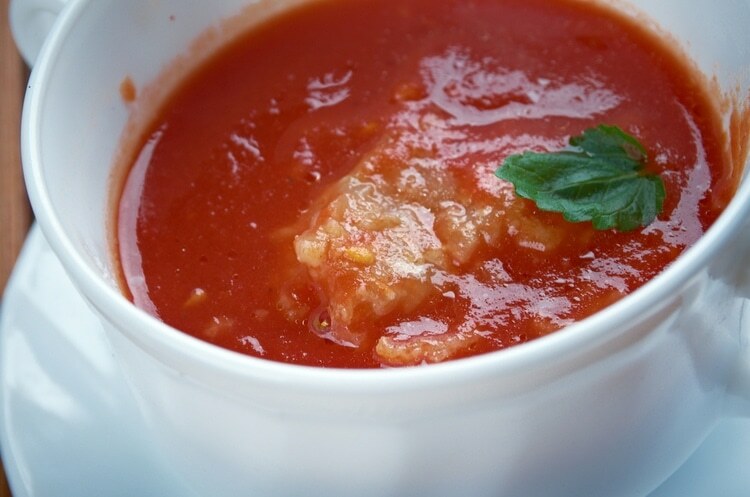 This is a very traditional Hungarian soup with a paprika-spiced broth and thick cuts of fish. Back in the days, the soup was often made outside over an open fire. 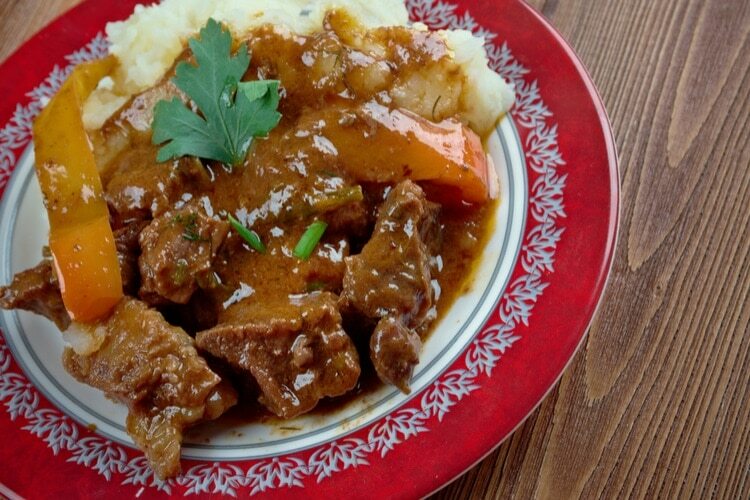 This is without a doubt one of the most traditional Hungarian foods, and it’s known worldwide as goulash. 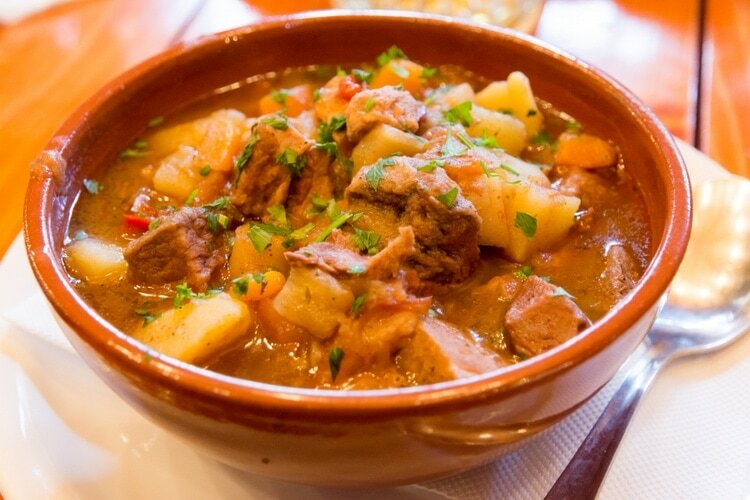 The dish is made of chunks of beef, potatoes, vegetables + paprika and spices. Breaded and fried cheese. It’s delicious! 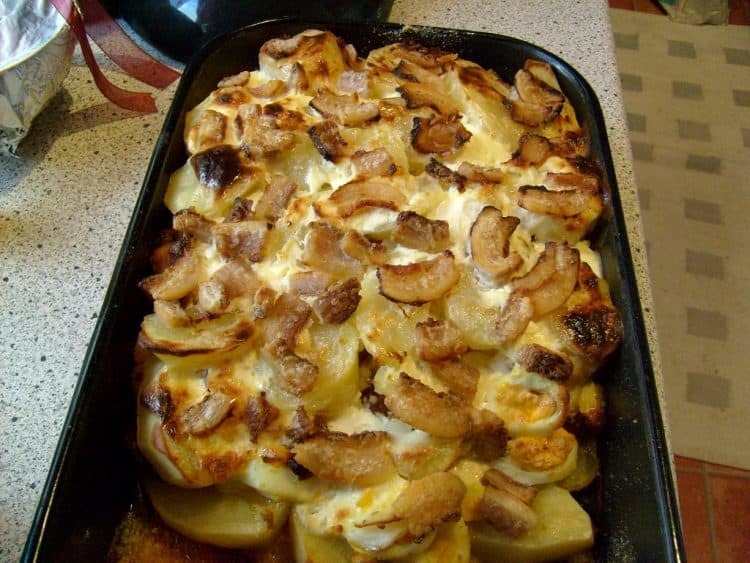 This is a potato casserole with bacon, eggs, and sausages. 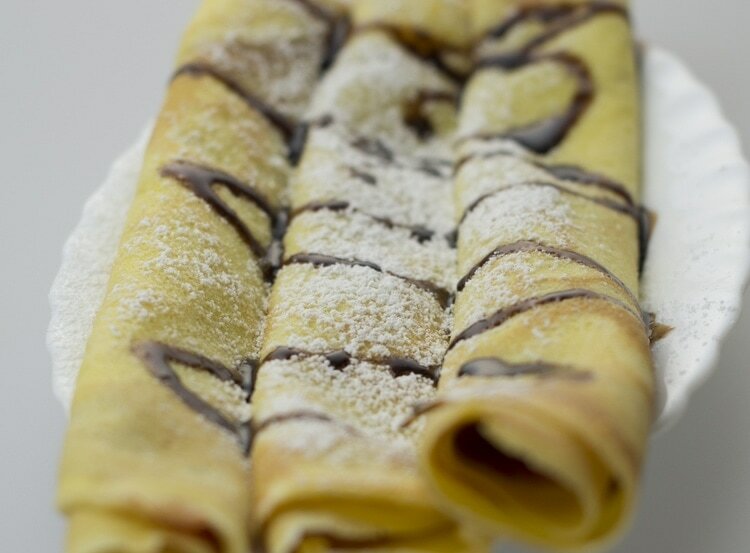 The Hungarian version of crepes or pancakes. After Gulyas and Langos, this is definitely my favorite Hungarian food. Hortobágyi palacsinta is a Hungarian pancake, filled with meat, spices, onions. 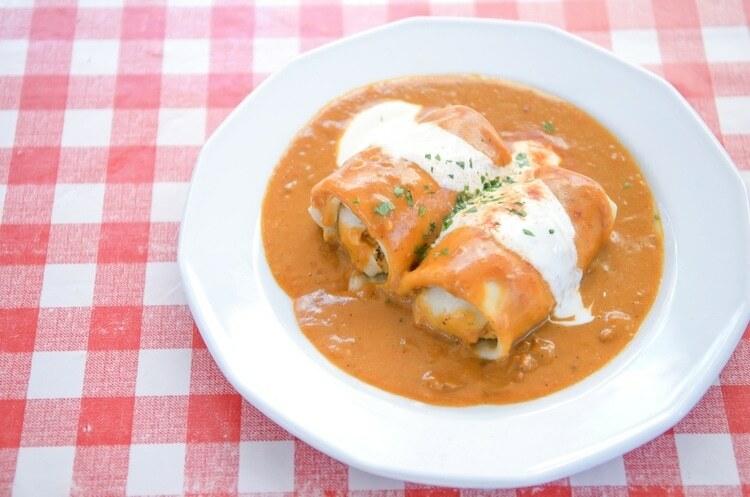 The meat is sauteed with paprika and the fillings as in a stew, and the sauce is then drained when the meat and fillings are put inside the crepe. Sour cream and flour are then being whiskered into the remaining sauce and baked until bubbly. Meat stews or stews and soups, in general, are popular Hungarian foods, and Pörkölt is a real classic. It’s a thick meat stew with paprika-spiced sauce. The types of meat can differ, the importance lies in getting the meat real tender. 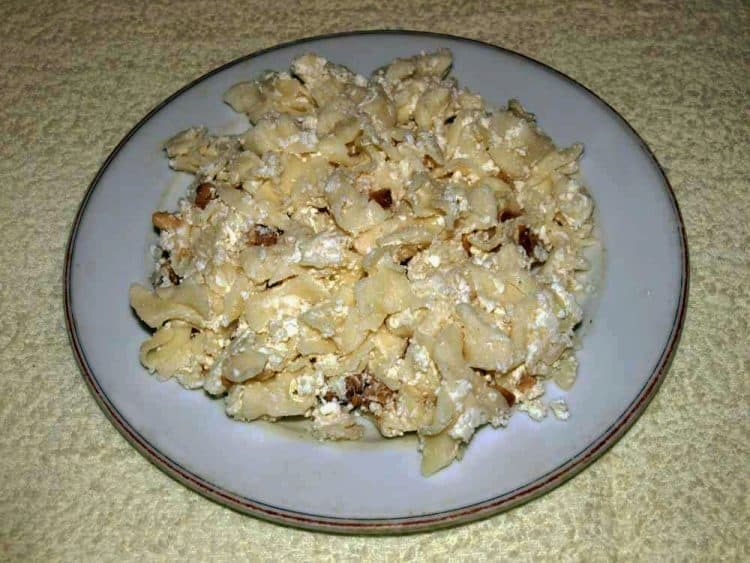 Pörkölt is often served with the Hungarian noodles known as Nokedli. 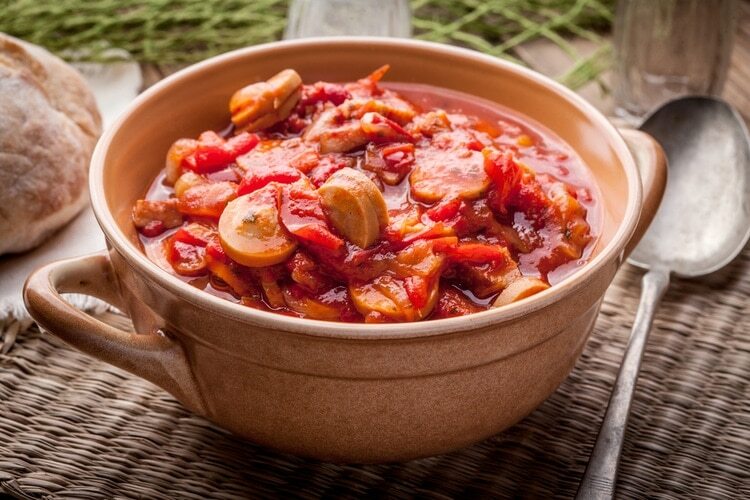 Paprikas Krumpli is a paprika-based stew with spicy sausages and potatoes. Simple, but very tasty! 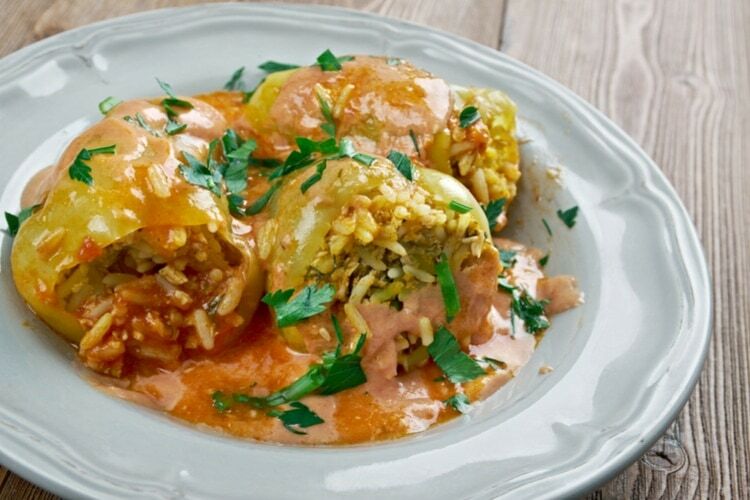 These are stuffed cabbage leaves that are pickled. 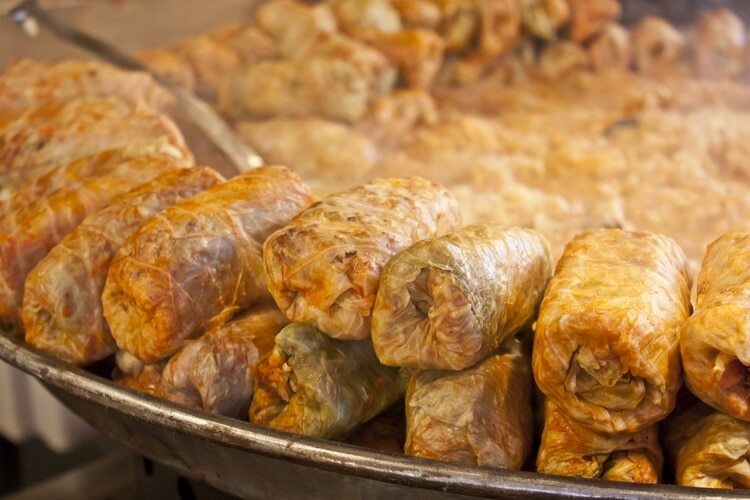 The cabbage leaves are filled with meat and rice, and they’re being cooked and smothered with sour cream. A sour cherry soup. It’s a little bit sweet, and it’s made of sour cream, sugar, and sour cherries. The soup is served cold. Sausages are very common in Hungary, and they’re delicious. Hungarian sausages are some of the best in the world, and they come in many variations. Mangalica is a special pig breed that is raised in Hungary, and it’s one of the fattiest pigs in the world. 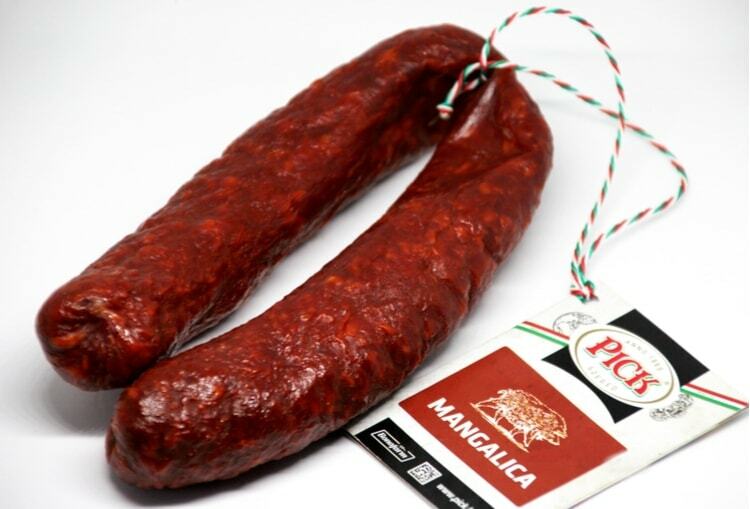 The meat from Mangalica pigs can be cooked in many different ways, but it’s most popular as sausages and air-cured meat. Mangalica meat is being sent to Spain, where it’s being air-cured for 2 years. It’s famous worldwide, and you shouldn’t miss out on trying this unless you’re a vegan or vegetarian. A paprika based vegetable stew with tomatoes, onions, and peppers. 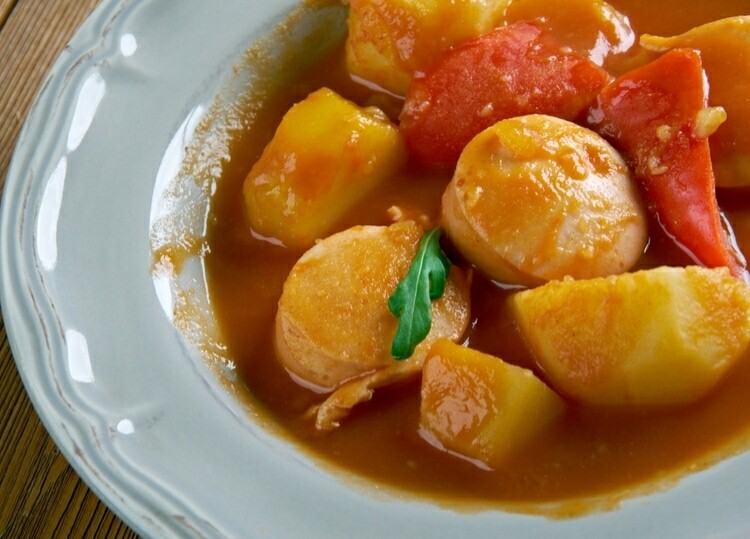 Lecsó comes in different versions, some also include potatoes, sausage, egg or bacon. Every region has its own version, and there are also special family recipes. Fözelek can be made with a big variety of ingredients, but basically, it is a thick vegetable stew or soup. Hungarian noodles mixed with Túró cheese, and often topped with fatty bacon. 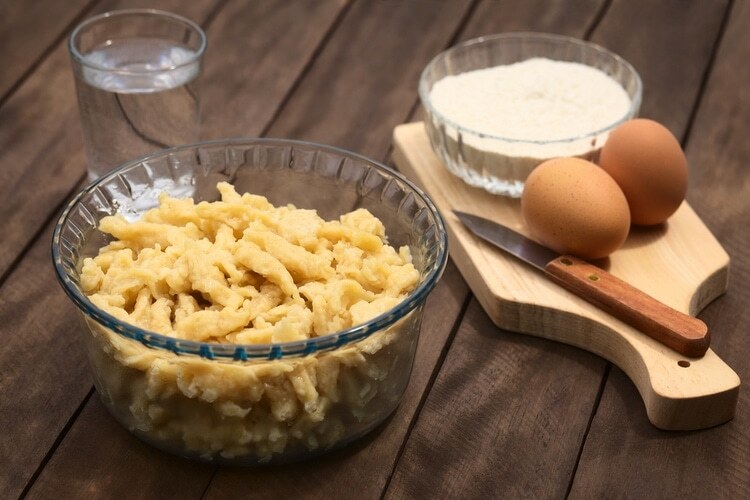 Hungarian noodles, known as Spätzle in German. This dish is very much the same as the Paprikás Csirke, but instead of chicken, it’s made with catfish. The Hungarian breakfast is hearty and makes a great start to the day. A typical breakfast in Hungary will consist of fresh bread, cold cuts, sausages, eggs, paté, and cheese. 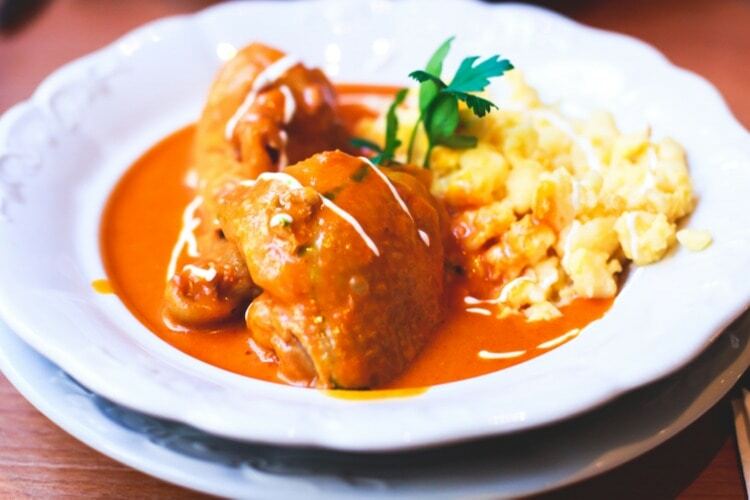 Paprika is the heart of Hungarian cuisine and the traditions go all the way back to the first Hungarians, and some of the dishes have been cooked the same way for hundreds of years. Traditional Hungarian food is mostly based on meat, seasonal vegetables, dairy products, and cheese. 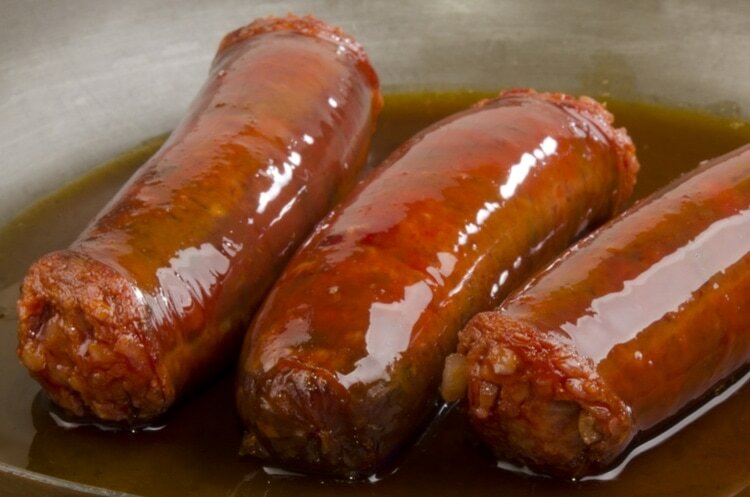 As mentioned already, sausages are something that Hungary is famous for. Bread is also a staple food, often served to each meal. Soups and stews are important parts of the Hungarian kitchen, and every region has their own specialties and versions of the traditional dishes. Which of these Hungarian Dishes would you like to try? Or, have you already been, which Hungarian Food is your favorite?